The Power Pro Lithium-Ion Rechargeable Batteries provide high quality green energy with excellent performance. Power Pro 18500 works for the following applications: Solar Lighting, Home Security Systems, Digital Cameras, Mobile Mouse or keyboard, GPS, Digital calipers, calculators, electronic clocks, medical equipment, measuring instrument, sensors, radio receiver, and many other electronic devices. [ APPLICATIONS ] - tactical flashlights, torch lights, keyboards, digital cameras, home security systems, GPS, calculators, electronic clocks, and many other applications. [ HIGH QUALITY ] - No memory effect, can be charged up to 1200 times when fully charged or partially drained. 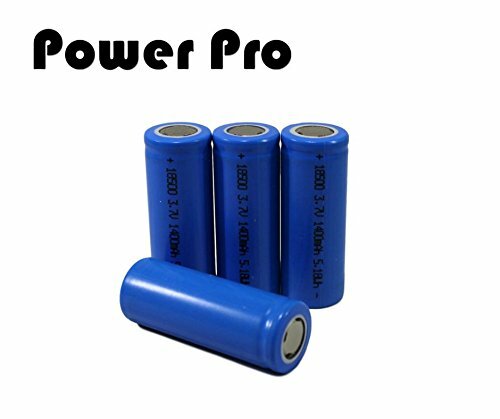 Power Pro Batteries are made with high quality cells. If you have any questions about this product by PowerPro, contact us by completing and submitting the form below. If you are looking for a specif part number, please include it with your message.